Trailhead is located on Rt. 93, at the Lafayette Place Campground in Franconia, NH. There are parking areas on both sides of the highway. Heading north, the main trailhead parking is 1.7 miles from the Basin exit. The Franconia Ridge is the essential White Mountains hike. 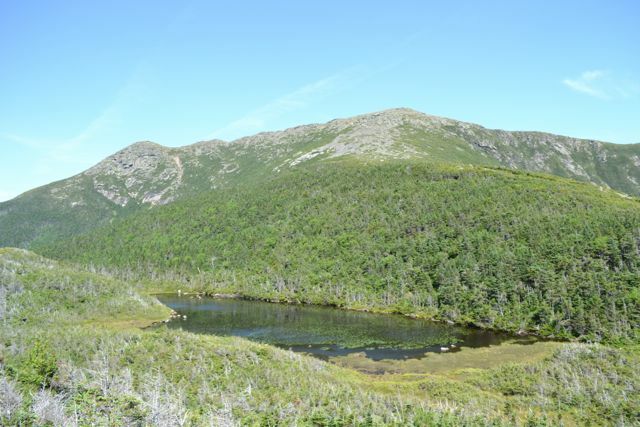 The highlight is the incredible two-mile skyway of the Franconia Ridge Trail as it follows the crest of the alpine ridge from Little Haystack Mountain to Mt. Lincoln to Mt. Lafayette. As you hike in the open, surrounded only by rocks and tiny alpine flowers, marvelous wilderness views are in every direction, with the wild expanse of the Pemigewasset Wilderness in one direction and the great Franconia Notch on the other. The ascent to the ridge is long and rough, but many exciting water features along the way break up the climb. Near the beginning, you enjoy the namesake of Falling Waters Trail, three waterfalls and a multitude of cascades on Dry Brook. And on the descent, you enjoy innumerable views back toward the ridge, as well as a small lake and an AMC hut. As usual with the classic hikes of the Whites, beware the legendary crowds that accumulate on weekends and holidays. The hike starts at the Lafayette Place Campground parking. The best and most popular way to complete the loop is counter-clockwise, ascending the Falling Waters Trail and returning on the Greenleaf Trail and Old Bridal Path. Proceed 0.1 miles up the paved path to the trailhead. The two trails coincide for the first 0.2 miles in the forest, then Falling Waters Trail turns right (and you will follow) and crosses a bridge over Walker Brook. It continues up into the forest at gradual grades for the next half mile. After a slight descent, it crosses Dry Brook. The trail, now fairly rocky, climbs parallel to the stream, soon passing Stairs Falls, a short and wide plunge. Just behind Stairs is Swiftwater Falls, a taller, winding cascade. The trail crosses the brook at Swiftwater, then begins to climb. After a half mile walk, the trail passes 80-foot high Cloudland Falls, the tallest and most beautiful of the three, where Dry Brook fans out gracefully over a cliff. The trail then ascends on the side of the falls, where you encounter steep rock slabs. At the top of Cloudland, you are rewarded with two more cascades at two converging brooks and a minor viewpoint of Mt. Moosilauke. For only the hike to Cloudland Falls, see Waterfalls of Falling Waters Trail. The trail continues up along the brook, crossing three times and passing another two cascades before leading away on a long switchback. Soon, the trail ascends with many shorter switchbacks. The trail is fairly rugged in this section. After climbing 1300 feet in 1.2 miles, you can take a spur path to Shining Rock, the first viewpoint since Cloudland Falls. Shining Rock is an impressive cliff with a perpetual stream of water running over it. From a narrow ledge at the bottom of the rock, there is a very nice view over the notch to Lonesome Lake, the Kinsman Range, and Mt. Moosilauke. After Shining Rock, the trail continues upward at an even steeper grade. The terrain begins to change, as the trees become shorter and the trail rockier. The view quickly rises behind you. The trail emerges in the alpine zone just below the summit of Little Haystack after 0.4 miles. While Little Haystack can hardly be called a mountain (it is more like a small bump on the ridge), the views from the summit are incredible. As you stand on the top of the ridge, the green forests from which you came rise sharply up the sweeping slope to mingle with the harsh grey-brown of the alpine zone where you are now. Directly south, the ridge drops into the forest and rolls south to the pointy summits of Mts. Liberty and Flume. Behind them are the mountains of Waterville Valley, Mt. Osceola, Mt. Tecumseh, and Scar Ridge. More distant and to the left, the Sandwich Range stretches across your view, blocking the horizon. To the southeast is the valley of the East Branch of the Pemigewasset Wilderness, with Mts. Carrigain and Hancock behind. To the east is the vast expanse of the Pemigewasset Wilderness, with long, ridge-like Owl's Head Mountain below in the foreground and the Twin Range behind, with the alpine areas on Mt Guyot and the Bond-Bondcliff ridge in full view. This direction is somewhat blocked from here, but as you walk a bit further up the ridge, it will become more open. To the north, the ridge climbs higher into the alpine zone, toward your next destination, Mt. Lincoln. To the northwest, in the distance, is much flat terrain in Vermont. To the west is the other side of Franconia Notch, Cannon Mountain and the Kinsmans, looking like gentle hills in contrast to the terrain where you stand now, high above. Below, you can spot a section of I-93 and the parking area where you began this hike. To the southwest is Mt. Moosilauke. Turn left onto the Franconia Ridge Trail and continue off Little Haystack to climb Mt. Lincoln. The trail is now a narrow dirt walkway, lined with carefully-placed rocks. Watch for the tiny alpine flowers on both sides of the path. Enjoy this immersive section of easy walking and breathtaking views. Soon, the trail begins to climb. Its ascent is mostly gentle, but passes huge, rugged, castle-like rock formations. Reach Mt. Lincoln in 0.7 miles. As you crest the summit, Mt. Lafayette appears before you. You can now see Mt. Garfield below Mt. Lafayette; views of this area will improve as you continue. Other than this, the view from the summit of Mt. Lincoln is nearly the same as the view from Little Haystack. It is one mile from Lincoln to Lafayette. The trail descends Lincoln, and goes up and down over a few humps before ascending unofficially named and rarely recognized Truman Peak. Again, the view is much the same, as it does not significantly change until summiting Lafayette. After another short descent and a pass through a patch of vegetation, the trail once again climbs. This is the longest climb of the ridge, but once you reach this final summit, the view to the north will finally be revealed, and you will be standing at the highest point in the White Mountains outside of the Presidential Range. The view here is again the same in three directions (but higher), but now the view to the north has opened, revealing mostly flat terrain with the distant ranges of the Great North Woods. To descend, head to the trail junction near the old foundation and follow Greenleaf Trail, which leads steeply down through the alpine zone, providing the last opportunity to enjoy the western view as you descend a half mile back to the treeline. After a short descent through the trees, the trail passes marshy Eagle Lakes and leads out to the AMC's Greenleaf Hut, where backpackers can make reservations to stay the night. From the deck on the hut, there is a wonderful view over the lake and back at the ridge. Greenleaf Trail turns right here to head toward the Cannon Tramway parking; turn left and follow Old Bridal Path. The trail traverses the long, rugged Agony Ridge from which there are still many more viewpoints. For the next mile, viewpoints appear at regular intervals and the trail descends a few steep, tricky rock scrambles. When the last of the view fades away, all that remains is a long (2 miles) forest descent back to the parking lot, initially steep but becoming moderate.